Last week I photographed two demonstrations against the police treatment of demonstrators, particularly at the April 1 demonstrations in the City of London, but also more generally. There does seem to be a growing realisation that the police over the last few years have changed the emphasis in their policing of protests. The setting up of the para-military Tactical Support Group, trained and equipped for street combat, and the increasing use of surveillance techniques, including CCTV and the intentionally confrontational use of photography by the Forward Intelligence Teams have led to a raising of the temperature of inevitable friction between police and protesters. A temperature that “kettling” then increases to further heights until things too often boil over. Increasing the police appear to see this as a battle, and come prepared, mentally and physically for a fight. The TSG in particular tend to stand like a group of thugs, bouncing on the balls of their feet, rubbing fists in palms, itching for a fight. It isn’t how I want police to be. 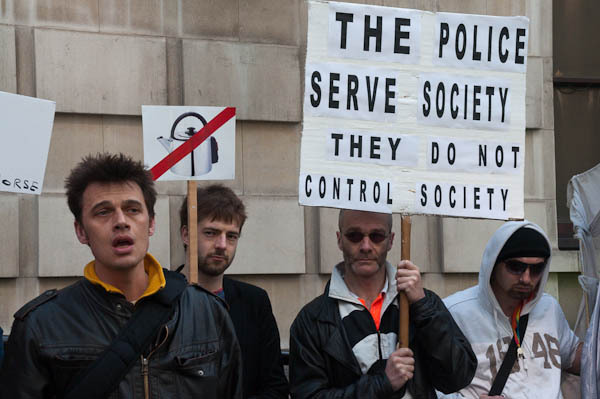 As a placard on Saturday reminded us “The police serve society – they do not control society“. That’s how it should be, but increasingly not how it is. Of course a part of the problem is legislation. Poorly thought out knee-jerk reactions to terrorism which have done little if anything to increase our security but have led to hundreds of highly publicised raids and arrests, but very few charges – and even many of those clearly unfounded, and thrown out by courts. Police campaigns to increase paranoia – particularly against photographers – haven’t helped. Nor has the campaign they have mounted against the press, which was very evident on April 1, with injuries to a number of my colleagues. They also threatened many journalists with arrest to try to clear them away at Bank, apparently because they didn’t want witnesses to the use of police dogs on the protesters. One piece of legislation that has led to more friction than any other is SOCPA, where late additions were made to an act dealing with serious organised crime with the intention of outlawing the protest in Parliament Square by Brian Haw. 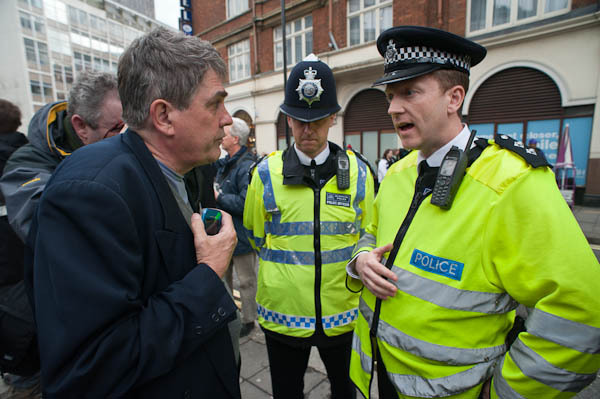 The act failed to stop his protest but made it an offence to protest in a wide area of Westminster without getting police permission in advance. Its main effect has been a vast increase in the number of demonstrations – both legal and illegal – many directed at the act itself, with a few unfortunate individuals being targeted for often rather dubious prosecutions. At the protest outside New Scotland Yard on Wednesday evening, police pointed out to the organisers that their protest on the wide expanse of pavement outside the building was illegal, and asked them to move to the other side of the street where it would be legal. The very narrow pavement there made such a move impractical, and unsurprisingly when the matter was put to the demonstrators they were unanimous in deciding to stay put. City of London Police were rather more relaxed at the demonstration outside their Wood St headquarters on Saturday morning, attended by three of the large ‘Four Horseman of the Apocalypse‘ puppets from the April 1 carnival at Bank and the remains of the fourth destroyed there. 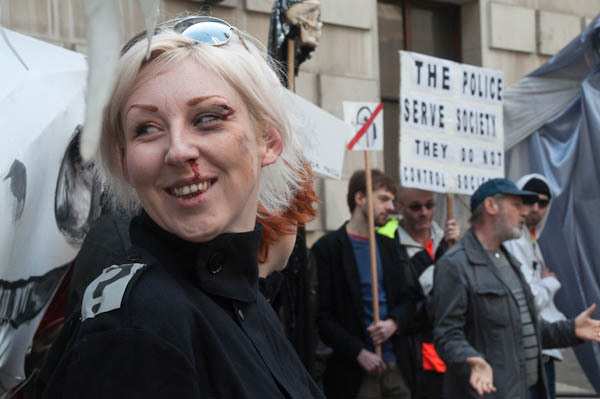 Some of the protesters also showed signs of the attacks by police on demonstrators there and on the even more peaceful Climate Camp in Bishopsgate. More pictures and details of events at New Scotland Yard and City of London Police HQ on My London Diary. This entry was posted on Tuesday, April 21st, 2009 at 10:26 am and is filed under My Own Work, Photo Issues, Political Issues. You can follow any responses to this entry through the RSS 2.0 feed. You can leave a response, or trackback from your own site.